But Muslim views of Hezbollah reflect a deep sectarian divide in Lebanon, where the group’s leader, Hassan Nasrallah, is threatening violence if a United Nations tribunal indicts Hezbollah members for the 2005 assassination of former Prime Minister Rafik Hariri. More than nine-in-ten (94%) Lebanese Shia support the organization, while an overwhelming majority (84%) of Sunnis in that country express unfavorable views. Muslims cannot rate Hezbollah, but views are on balance positive among those who do offer an opinion of the group in Nigeria and Indonesia. The survey, conducted April 12 to May 7 by the Pew Research Center’s Global Attitudes Project, finds that the Palestinian organization Hamas, which, like Hezbollah, has been classified as a terrorist organization by the U.S. and other Western governments, also receives mixed ratings across the Muslim publics surveyed. Jordanian Muslims express the most support – 60% have a favorable view of Hamas – while Muslims in Turkey offer the least positive ratings (9% favorable and 67% unfavorable). Opinions of Hamas are nearly evenly split in Egypt and Lebanon. In most countries, views of Hamas and Hezbollah have changed little, if at all, since 2009. In Indonesia, however, more Muslims express favorable views of both groups now than did so last year; 39% now have positive views of Hamas, compared with 32% last year, and 43% have favorable opinions of Hezbollah, compared with 29% in 2009. And among Nigerian Muslims, favorable views of both Hamas and Hezbollah are now less common than they were in 2009 (49% vs. 58% and 45% vs. 59%, respectively). The survey also finds that Muslim publics overwhelmingly welcome Islamic influence over their countries’ politics. 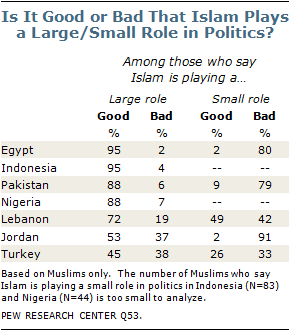 In Egypt, Pakistan and Jordan, majorities of Muslims who say Islam is playing a large role in politics see this as a good thing, while majorities of those who say Islam is playing only a small role say this is bad for their country. Views of Islamic influence over politics are also positive in Nigeria, Indonesia, and Lebanon. Turkish Muslims express more mixed views of the role Islam is playing in their country’s political life. Of the 69% who say the religion plays a large role, 45% see it as good and 38% see it as bad for their country. Among the minority of Muslims who say Islam plays a small role in politics, 26% consider this to be good for Turkey and 33% say it is bad. When asked for their views about democracy, majorities in most of the Muslim communities surveyed say that democracy is preferable to any other kind of government. This view is especially widespread in Lebanon and in Turkey, where at least three-quarters of Muslims (81% and 76%, respectively) express a preference for democratic governance. Support for democracy is less common in Pakistan, but a plurality (42%) of Muslims in that country prefer democracy to other types of government; 15% of Pakistani Muslims say that, in some circumstances, a non-democratic government can be preferable, and 21% say that, for someone like them, the kind of government their country has does not matter. Many Muslims see a struggle between those who want to modernize their country and Islamic fundamentalists. Only in Jordan and Egypt do majorities say there is no such struggle in their countries (72% and 61%, respectively). Eight-in-ten Muslims in Pakistan say suicide bombing and other acts of violence against civilian targets in order to defend Islam from its enemies are never justified; majorities in Turkey (77%), Indonesia (69%) and Jordan (54%) share this view. Support for suicide bombing has declined considerably over the years. For example, while 74% of Muslims in Lebanon said these violent acts were at least sometimes justified in 2002, just 39% say that is the case now; double-digit declines have also occurred in Jordan, Pakistan, Nigeria and Indonesia. Muslim publics offer a mixed view of Hezbollah. The Shia organization, which has political and military operations in Lebanon, receives favorable ratings from 55% of Jordanian Muslims and from an even narrower majority (52%) of Muslims in Lebanon. 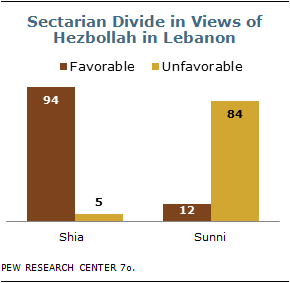 Not surprisingly, Lebanese Shia are particularly supportive of Hezbollah – 94% have a favorable view, compared with 12% of Sunni Muslims and 20% of Christians in Lebanon. In Egypt, views of Hezbollah are overwhelmingly negative; just three-in-ten Muslims in that country have a favorable opinion of the group, while 66% have an unfavorable opinion. Egyptian Muslims have become increasingly critical of Hezbollah in recent years. In 2007 and 2008, majorities said they had a positive view of Hezbollah (56% and 54%, respectively); in 2009, 43% of Muslims in Egypt said that was the case. Outside of the Middle East, many cannot rate Hezbollah. About seven-in-ten Muslims in Pakistan (69%) as well as nearly three-in-ten Muslims in Nigeria (28%) and Indonesia (27%) and 21% in Turkey do not offer an opinion. In Nigeria and Indonesia, Muslim views of Hezbollah are, on balance, positive; more than four-in-ten Muslims in each country express favorable views (45% and 43%, respectively), while about a quarter in Nigeria (26%) and 30% in Indonesia have unfavorable opinions of the organization. Views of Hezbollah have become more favorable among Indonesian Muslims compared with last year, when 29% expressed positive opinions; among Nigerian Muslims, opinions are now less favorable than they were in 2009, when nearly six-in-ten (59%) had positive views of the Lebanese-based group. In Turkey, Muslims offer overwhelmingly negative opinions of Hezbollah, as has been the case the three previous years when this question was asked. About three-quarters (74%) of Turkish Muslims have an unfavorable view of the extremist group, while just 5% see it favorably, virtually unchanged from last year. militant Palestinian organization, while just 34% have an unfavorable view. In contrast, Muslims in the other Middle Eastern countries polled are nearly evenly divided in their views of Hamas: 49% of Muslims in Egypt and Lebanon have a favorable opinion and 48% in each country have an unfavorable view of the group. In Lebanon, Muslim views of Hamas reflect a sharp sectarian divide. About nine-in-ten Lebanese Shia (92%) express favorable views of the Palestinian group, although its membership is predominantly Sunni. Among Sunnis in Lebanon, however, an overwhelming majority rejects Hamas; 86% have an unfavorable view and just 9% have a favorable opinion of the organization. Christians in that country share the views of Sunni Muslims; 87% have a negative view of Hamas, while one-in-ten have a positive view. As with views of Hezbollah, many outside of the Middle East cannot rate Hamas. Nearly seven-in-ten Pakistani Muslims (69%) and about a quarter of Muslims in Indonesia (27%), Nigeria (26%) and Turkey (24%) do not offer an opinion of the Palestinian group. In Nigeria, the balance of opinion is positive; twice as many Muslims in that country have a favorable view of Hamas (49%) as have an unfavorable view (25%). Yet, favorable ratings of Hamas have declined since 2009, when about six-in-ten (59%) Nigerian Muslims expressed positive opinions. Nigerian Christians offer far more negative ratings of Hamas than do Muslims in that country; just one-in-ten have a favorable opinion and four-in-ten have an unfavorable opinion of the Islamic group. Half of Christians in Nigeria do not offer an opinion of Hamas. In Turkey, opinions of Hamas are decidedly negative, with just 9% of Muslims expressing favorable views and two-thirds giving the militant organization an unfavorable rating. Opinions of Hamas are more mixed in Indonesia and Pakistan. For the most part, views of Hamas vary little, if at all, across demographic groups. Yet, in Egypt, the Palestinian group receives more support from older and less educated Muslims. More than half (55%) of Egyptian Muslims ages 50 and older have a favorable view of Hamas, compared with 48% of those ages 30 to 49 and 45% of those younger than 30. And while 54% of those with a primary education or less express positive opinions, 48% of those with at least some secondary education and even fewer (40%) of those with some college education do so. 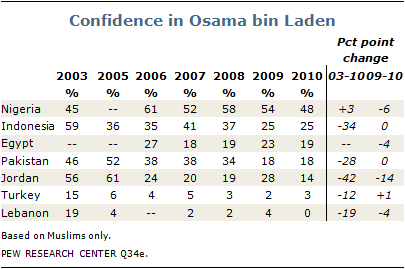 Opinions of al Qaeda and Osama bin Laden remain largely negative among the Muslim publics surveyed. Majorities of Muslims in five of the seven countries express unfavorable views of the extremist group and say they have little or no confidence in its leader. Lebanese Muslims are, by far, the most critical of al Qaeda and bin Laden. Only 3% have a positive opinion of the organization, while 94% have a negative opinion. Virtually no Lebanese Muslims express confidence in bin Laden; 98% say they have little or no confidence in al Qaeda’s leader. Similarly, just 4% of Muslims in Turkey have a favorable opinion of al Qaeda and 3% express at least some confidence in bin Laden, while 74% offer negative views of both. In Egypt, about one-in-five Muslims offer positive opinions of bin Laden (19%) and his organization (20%), while more than seven-in-ten express negative views of each (73% and 72%, respectively). Among Muslims in Indonesia, about a quarter have a favorable view of al Qaeda (23%) and express at least some confidence in bin Laden (25%). Muslims in Jordan offer more positive views of the organization (34% favorable) than of its leader (14% have at least some confidence in bin Laden), although opinions of both are overwhelmingly negative. In 2009, about three-in-ten (28%) Jordanian Muslims had confidence in al Qaeda’s leader. Pakistani Muslims also have negative views of bin Laden; just 18% express at least some confidence in him, while 45% say they have little or no confidence in the al Qaeda leader. Nearly four-in-ten (37%) do not offer an opinion. Nigerian Muslims stand apart as the only Muslim public surveyed where views of al Qaeda and bin Laden are, on balance, positive. About half of Muslims in Nigeria express favorable views of the extremist group (49%) and say they have at least some confidence in its leader (48%), while just 34% offer negative opinions of al Qaeda and 40% express little or no confidence in bin Laden. Majorities of Muslims in three of the six predominantly Muslim countries surveyed, as well as in Nigeria, say that Islam plays a very or fairly large role in the political life of their countries. This view is especially prevalent in Indonesia and Nigeria, where nearly nine-in-ten Muslims (89% and 88%, respectively) say Islam exerts considerable influence in their country’s politics; 69% of Turkish Muslims and 54% of Lebanese Muslims also see Islam playing a large role in the political life of their countries. In Pakistan, a 46% plurality of Muslims say Islam plays a large role, while 36% say it plays a small role in Pakistani politics. Opinions are about evenly divided in Egypt, where 48% of Muslims say Islam plays a large role in their country’s political life and 49% say it plays only a small role. Jordan is the only country surveyed where a majority of Muslims say Islam plays a small role in their country’s politics; 64% of Jordanian Muslims say that is the case, while just about a third (34%) sees substantial Islamic influence in political life. Pakistani Muslims are less likely than they were five years ago to say that Islam plays a large role in their country’s political life; in 2005, more than six-in-ten (63%) saw Islam as having considerable influence. Muslims in Jordan and Lebanon are much less likely than they were in 2002, when the Pew Global Attitudes Project first asked this question, to say Islam is playing a large role in their countries’ politics; nearly two-thirds of Muslims in Lebanon (65%) and 53% in Jordan believed that was the case in 2002. Yet, in Jordan, the percentage of Muslims who say Islam plays a large role in politics has increased somewhat since 2005, when 27% shared that view. In Turkey, the view that Islam plays a major role in politics has become somewhat more common since 2005, and is now much more common than was the case in 2002. While nearly seven-in-ten currently say Islam exerts considerable influence, Turkish Muslims were basically divided eight years ago: 45% said Islam played a large role and 44% said it played a small role in their country’s politics. Muslims in Nigeria and in nearly all of the predominantly Muslim countries surveyed overwhelmingly welcome Islamic influence over their countries’ politics. In Indonesia, about nine-in-ten Muslims (91%) either say that their religion plays a large role in politics and that this is a good thing or that Islam plays a small role and that this is a bad thing. Similarly, at least three-quarters of Muslims in Egypt (85%), Nigeria (82%) and Jordan (76%) consider Islamic influence over political life to be a positive thing for their country, as do 69% of Muslims in Pakistan and 58% in Lebanon. Only in Turkey are opinions about the role of Islam in political life more mixed. About four-in-ten (38%) Turkish Muslims say Islam plays a large role and embrace its influence in their country’s politics or say it is bad that Islam plays only a small role; about three-in-ten (31%) say Islam’s influence is negative. Lebanese Christians are far more likely than Muslims in that country to say Islam plays a large role in politics in Lebanon. Two-thirds of Christians see substantial Islamic influence, compared with 55% of Sunni and 52% of Shia Muslims in Lebanon. In Nigeria, however, Christians are less likely than Muslims to say Islam plays a large role in the political life of their country. While nearly nine-in-ten Nigerian Muslims (88%) believe Islam exerts considerable influence, about six-in-ten (62%) Nigerian Christians share this opinion. 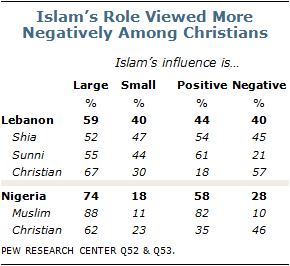 In both Lebanon and Nigeria, Christians express much more negative views than Muslims about the role of Islam in their countries’ politics. About a third (35%) of Nigerian Christians welcome Islamic influence, while 46% see it as a negative thing for their country; Nigerian Muslims overwhelmingly embrace the influence of their religion in political life. Close to six-in-ten (57%) Lebanese Christians either say that Islam plays a large role and see this as a bad thing or say Islam plays a small role and see this as a good thing for their country; about the same percentage (58%) of Muslims in that country embrace Islamic influence in politics. Shia Muslims in Lebanon express more negative views about Islam’s influence in politics than do Sunnis, although majorities in both groups welcome the religion’s influence over their country’s political life. About six-in-ten (61%) Sunnis and 54% of Shia either say it is good for Islam to play a large role or that it is bad for Islam to play a small role in Lebanon’s political life. Yet, far more Lebanese Shia than Sunnis describe Islam’s role in a negative way (45% and 21%, respectively). Many Muslims see a struggle between groups that want to modernize their countries and Islamic fundamentalists, and in five of the seven countries where the question was asked, more of those who see a struggle identify with the modernizers than with fundamentalists. More than half in Lebanon (53%) and Turkey (52%) see a struggle in their country between modernizers and fundamentalists. Opinions are more mixed in Indonesia and Nigeria. About four-in-ten (42%) Nigerian Muslims say there is a struggle in their country, while 46% say there is not; in Indonesia, Muslims are equally divided, with 42% saying there is a struggle between those who want to modernize their country and Islamic fundamentalists and the same number saying they do not see a struggle. A considerable number of Pakistani Muslims (44%) also say there is currently a struggle between modernizers and fundamentalists in their country, but the same percentage of Muslims in Pakistan do not offer an opinion on the matter; just 12% see no struggle. Only in Jordan and Egypt do majorities of Muslims say there is no struggle between modernizers and Islamic fundamentalists in their countries. About seven-in-ten (72%) Jordanian Muslims and 61% of Egyptian Muslims offer this opinion; just 20% and 31%, respectively, see a struggle in their countries. In both of these countries, however, Muslims are now more likely than they were in 2009 to say there is a struggle; a year ago, 14% of Muslims in Jordan and 22% in Egypt saw a struggle in their countries. 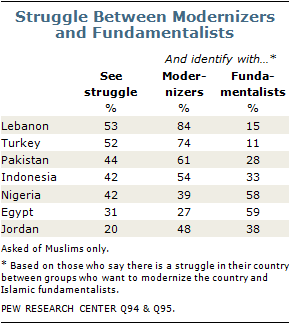 Among Muslims who see a struggle between modernizers and Islamic fundamentalists, majorities in Lebanon (84%), Turkey (74%), Pakistan (61%) and Indonesia (54%) side with those who want to modernize their countries; a plurality of Jordanian Muslims who say there is a struggle in their country also side with the modernizers (48%). In Egypt and Nigeria, however, most Muslims who see a struggle in their countries say they identify with Islamic fundamentalists (59% and 58%, respectively). Muslim publics offer mixed views of gender segregation in the workplace. Pakistani Muslims are the most supportive: 85% say they would favor making segregation of men and women in the workplace the law in their country. A narrower majority (54%) of Muslims in Egypt also support making gender segregation the law in their country. Opinions are more divided in Jordan and Nigeria. Half of Jordanian Muslims favor gender segregation and 44% oppose it. Among Nigerian Muslims, nearly the same percentage favor making segregation of men and women in the workplace the law in their country (49%) as oppose it (48%). In Lebanon, Turkey and Indonesia, majorities of Muslims reject legalized gender segregation in the workplace. More than eight-in-ten in Lebanon (89%) and Turkey (84%) express this opinion, as do 59% of Muslims in Indonesia. In most of the countries where this question was asked, men and women express similar views of gender segregation in the workplace. In Nigeria, however, Muslim men are considerably more likely than Muslim women to say gender segregation should be the law; 57% of Muslim men in Nigeria favor gender segregation, compared with 41% of Muslim women in that country. And in Jordan, Muslim women are especially supportive of segregation of men and women in the workplace; 54% favor it and 42% oppose it, while Muslim men in that country are nearly evenly divided (47% favor gender segregation and 46% oppose it). Views of harsh punishments also vary across the Muslim publics polled. Majorities of Muslims in Egypt, Jordan, Pakistan and Nigeria say they would favor making harsh punishments such as stoning people who commit adultery; whippings and cutting off of hands for crimes like theft and robbery; and the death penalty for those who leave the Muslim religion the law in their country. In the other predominantly Muslim countries surveyed – Turkey, Lebanon and Indonesia – most Muslims oppose these measures. About eight-in-ten Muslims in Egypt and Pakistan (82% each) endorse the stoning of people who commit adultery; 70% of Muslims in Jordan and 56% of Nigerian Muslims share this view. Muslims in Pakistan and Egypt are also the most supportive of whippings and cutting off of hands for crimes like theft and robbery; 82% in Pakistan and 77% in Egypt favor making this type of punishment the law in their countries, as do 65% of Muslims in Nigeria and 58% in Jordan. When asked about the death penalty for those who leave the Muslim religion, at least three-quarters of Muslims in Jordan (86%), Egypt (84%) and Pakistan (76%) say they would favor making it the law; in Nigeria, 51% of Muslims favor and 46% oppose it. In contrast, Muslims in Lebanon, Turkey and Indonesia largely reject the notion that harsh punishments should be the law in their countries. About three-quarters of Turkish and Lebanese Muslims oppose the stoning of people who commit adultery (77% and 76%, respectively), as does a narrower majority (55%) of Muslims in Indonesia. Opposition to whippings and cutting off of hands for crimes like theft and robbery and to the death penalty for people who leave Islam is even more widespread in these three countries; 86% of Muslims in Lebanon, 82% in Turkey and 61% in Indonesia are against making harsh punishments for robbery and theft the law in their countries, and 93%, 91% and 64%, respectively, object to the death penalty against those who leave the Muslim religion. For the most part, views of strict punishments do not vary consistently across demographic groups in seven countries where these questions were asked. One notable exception, however, is in Nigeria, where Muslim men express considerably more support than Muslim women for these types of punishments. More than six-in-ten (63%) Muslim men in Nigeria favor the stoning of people who commit adultery, while 36% oppose it; Muslim women in that country are evenly divided, with 49% saying they favor and the same number saying they oppose the stoning of adulterers. When it comes to the death penalty for those who leave Islam, Muslim men in Nigeria are clearly supportive (58% favor and 39% oppose), while a majority of their female counterparts (54%) are against the death penalty for those who leave the Muslim religion; 44% of Muslim women in Nigeria favor it. Finally, while majorities of Muslim men and women in Nigeria favor punishments like whippings and cutting off of hands for crimes like theft and robbery, men are somewhat more likely than women to say they favor these strict measures (69% of men vs. 61% of women). In nearly all of the countries surveyed, support for harsh punishments such as stoning people who commit adultery, whippings and cutting off of hands for crimes like theft and robbery and the death penalty for those who leave the Muslim religion coexists with support for democratic governance. With the exception of Pakistan, majorities of Muslims in all of the predominantly Muslim countries surveyed and in Nigeria say that democracy is preferable to any other kind of government. Support for democracy is particularly widespread in Lebanon, where about eight-in-ten Muslims (81%) prefer it to any other form of government; 76% of Muslims in Turkey, 69% in Jordan and nearly two-thirds in Nigeria (66%) and Indonesia (65%) also favor democratic government more than any other. A somewhat narrower majority of Muslims in Egypt (59%) say democracy is preferable to any other kind of government. In Pakistan, just about four-in-ten Muslims (42%) prefer democracy to other types of government; 15% of Pakistani Muslims say that, in some circumstances, a non-democratic government can be preferable, and 21% say that, for someone like them, the kind of government their country has does not matter. About one-in-five Pakistani Muslims (22%) do not offer an opinion. For the most part, views of democracy among Muslim publics are not tied to demographics. For example, in Nigeria as well as in all six of the predominantly Muslim countries surveyed, Muslims ages 18 to 29 were as likely as those ages 30 to 49 and those 50 and older to say that democracy is preferable to any other kind of government. Similarly, opinions about democracy vary little, if at all, across gender, income and education groups. 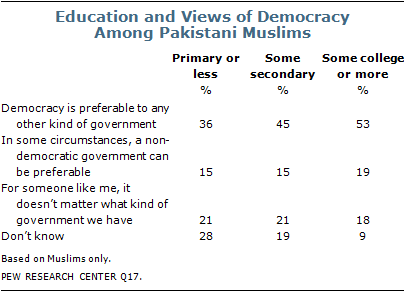 In Pakistan, however, Muslims with at least some college education are considerably more likely than those with less education to say that democracy is preferable to any other kind of government; more than half of Pakistani Muslims with some college education or more offer this opinion (53%), compared with 45% of those with a secondary education and just 36% of those with a primary education or less. Yet, those with less education are not necessarily more likely than those with some college to embrace other forms of government; a similar percentage in each group says that non-democratic government can be preferable and that the kind of government Pakistan has does not matter to people like them. Instead, Pakistani Muslims with a primary education or less are about three times more likely than those with at least some college to decline to offer an opinion (28% vs. 9%, respectively). In Nigeria, support for democracy is somewhat more widespread among Christians than among Muslims; 76% of Nigerian Christians say democracy is preferable to any other kind of government, compared with 66% of Muslims. Religious differences are less pronounced in Lebanon, where 86% of Christians and 81% of Sunni and Shia Muslims prefer democracy to other forms of government. 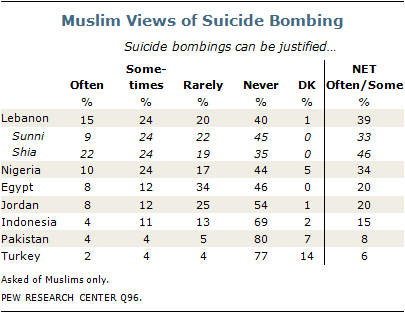 The Muslim publics surveyed generally reject the notion that suicide bombing against civilians can be justified in order to defend Islam from its enemies, but there is considerable support for this kind of violence in some countries. Muslims in Lebanon and Nigeria are the most likely to say suicide bombings can often or sometimes be justified; nearly four-in-ten Lebanese Muslims (39%) and 34% of Nigerian Muslims say that is the case. One-in-five Muslims in Egypt and Jordan offer support for suicide bombing in defense of Islam, as do 15% of Indonesian Muslims. Yet, far more in these three countries say these violent acts are never justified; 46% of Muslims in Egypt and a majority in Jordan (54%) and Indonesia (69%) reject suicide bombings. The notion that these types of attacks against civilians are never justified is even more widespread in Pakistan and Turkey, where 80% and 77%, respectively, share this view. Jordanian and Egyptian Muslims express somewhat more support for suicide bombing than they did in 2009, when 12% and 15%, respectively, said violence against civilians was justified in order to defend Islam. Compared with 2002, however, when the Pew Global Attitudes Project began tracking attitudes on this issue, far fewer across the Muslim world now endorse suicide bombings. For example, the percentage of Muslims saying these types of attacks are often or sometimes justified has declined 35 percentage points in Lebanon (74% in 2002), 25 percentage points in Pakistan (33% in 2002), and 23 percentage points in Jordan (43% in 2002). Support for suicide bombing does not vary consistently across gender, age, education or income lines. And, for the most part, those who favor the death penalty for people who leave the Muslim religion are no more likely than those who oppose it to say violent acts in defense of Islam can be justified. Only in Indonesia and Nigeria is that not the case; 22% of Indonesian Muslims and 39% of Nigerian Muslims who say people who leave their religion should receive the death penalty say suicide bombings are often or sometimes justified, compared with 12% and 29%, respectively, of those who oppose the death penalty for those who leave Islam. Islamic extremism continues to be a serious concern in nations with substantial Muslim populations. Large majorities in five of the six predominantly Muslim nations surveyed as well as in Nigeria, where roughly half of the population is Muslim, say they are very or somewhat concerned about the rise of Islamic extremism around the world. The only outlier is Turkey, where 39% are concerned. Many are also worried about the rise of Islamic extremism within their own countries. That is especially the case in Lebanon, where eight-in-ten – including 90% of Christians, 82% of Shia and 67% of Sunnis – express at least some concern. In Nigeria, roughly three-quarters (76%) are concerned about Islamic extremism in their country, including 83% of Muslims and 68% of Christians. Nearly two-thirds of Pakistanis (65%) express concern about Islamic extremism in their country, but fears have declined since last year, when 79% shared that view. About six-in-ten in Egypt (61%) and Indonesia (59%) and more than four-in-ten in Jordan (44%) and Turkey (43%) are also concerned about extremism in their countries.